Can Philosophy Unite a Divided World? As a scholar of the history of ideas, I’m interested in the debates pitting cosmopolitanism against nationalism. Roughly speaking, cosmopolitans believe that we can create spaces where people of different backgrounds and religions and nations can mingle and respect one another as individuals. Nationalists believe that a person’s identity is bound to and by the society, culture, political system, values and crucially language to which he or she belongs. Other is other. While these ideas might seem somewhat abstract, we are seeing them play out in the departure of the U.K. from the EU (to cries of “give us our country back”) and in the debates in Europe and the U.S. over the acceptance of Syrian and African refugees. Cosmopolitans believe in the possibility of a more diverse citizenry. Nationalists want to close the borders (and build walls along them). The Canadian philosopher Charles Taylor takes part in these debates at a meta level. He does not use the term “cosmopolitanism” and only very occasionally “nationalist.” But his ultimate objective in his latest book, The Language Animal, is to demonstrate how we can all live in a more tolerant “flexible” (his word) world—if we can learn how to make the most of the resources, above all the resources for communication, we all share. This is a continuation of the ideas he has been working on throughout his astonishingly long and productive career. Another group of early philosophers were the German Romantics Hamann, Herder, and Humboldt, (or HHH). They believed that languages were the creature of what Johann Gottfried Herder called “reflection”—a key term for Taylor—which meant that language was the product of society, or of the “communion” between individuals of which society is composed. To simplify a very complex argument: For HHH, language is in a constant process of expansion and is far more than mere words. It is not only all those things HLC dismissed—poetry, the novel—but also the visual arts and music, gestures and “body language.” Such things compose our social world. This second argument about language has clear moral and ethical implications in Taylor’s telling. If language is in a sense alive, then our ability to communicate, to connect, to create “communion” is inherently “flexible,” which means that we can come to understand and embrace new concepts and morals. As the world transcends its cultural borders, languages and culture change together, and we will begin to talk about human rights as shared ideals. Now if language is, in this way, the product of communion with others then this living, “flexible” language allows us all to move outward from the norms and values of our own particular society until we are able to embrace the whole world—past and present. It is this process which has allowed us (Western liberal democrats) to come up with the concept of “human rights”—which since 1948 has been transformed into the benchmark of a just and humane society. This is even more striking in the case of gay and LGBTQ rights. Forty years ago, gay rights were not seen as rights or norms at all. In a remarkably short period of time we have developed the language to speak about them, so we have shaped the meaning of rights so as to give it an entirely new set of meanings and implications. But not everyone agrees that this is a desirable thing. It is often argued that these norms, and rights are the creation of specific, in this case Western societies, and of the languages that are spoken in them, and in them alone. If “gay rights” are the creation of Western notions of “non-discrimination”—which they undeniably are—surely they can only apply to those societies in which such a notion already exists. Therefore, we cannot fault Nigerians (or Russians) for persecuting gays because they would—and do—argue that no such things as gay rights exist. Taylor is not this kind of moral relativist. He knows that language can also be put to perverse—he uses the word “evil” more than once—ends. And in a brief and powerful passage toward the end of The Language Animal, he makes the point that we—who believe in gay rights, women’s rights, human rights, etc.—can appreciate Chinese music without, at the same time, disparaging Beethoven or Chopin. But we cannot endorse slave societies or societies of castes or societies where women are utterly subordinate without renouncing our own. If one takes Taylor’s work on the flexibility of language as a hopeful view of humanity’s evolving capacity to live with one another, one has to reckon with the question of how we know that our values are shared by others. To me this is the wrinkle in Taylor’s thesis, because there can really be only two broad answers. One is religious (or quasi-religious): Our core values come from “beyond.” If the divine explanation doesn’t work, we are left with some form of utilitarianism. That is: Do the values and norms we have developed over time through our use of language make us better off, happier etc., than the norms and values that have developed in those slave-owning, women-oppressing caste societies? And from what standpoint can we judge whether they are better off or not, or indeed what “better-off” might mean for them? The only way to answer with the resounding “yes” that Taylor is calling for would seem to be to invoke the “Golden Rule”: Do unto others as you would have others do unto you. Taylor’s view of language allows us to hope that improvement and values can be brought about through language and the “communion” it both creates and is created by. In time these hypothetical (and in many places real) societies of oppressors and the oppressed may perhaps be brought to change the norms and values on which their current behavior is based. The only way to do this, Taylor believes, “lies through mutual understanding and exchange,” and that, of course can only be achieved through language. To change the world, we have to keep talking. Anthony Pagden is a distinguished professor in Political Science and History at UCLA. He is the author of The Enlightenment – And Why It Still Matters published by Random House in 2013. 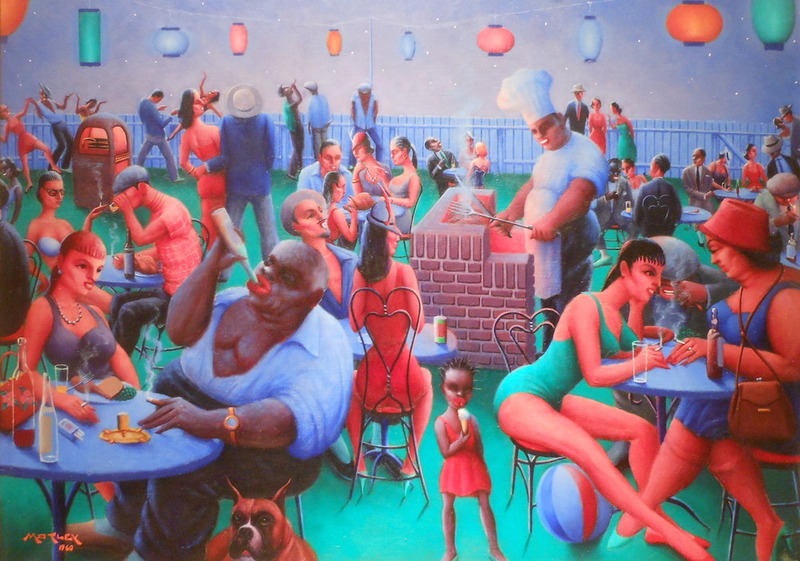 *Image by Archibald Motley. Courtesy of Wikimedia Commons.